Cassandra Data Masking from DataSunrise is a tool specifically created to ensure data privacy and keep corporate information safe. In order to prevent exposure and leak real data can be obfuscated statically or dynamically. The following sensitive data can be discovered and hidden: address, name, credit card details, medical information, etc. When Cassandra Data Masking from DataSunrise is activated, it makes sensitive data meaningless or unreadable for unauthorized readers. So, what is the difference between the static and dynamic Cassandra Data Masking? When you use static Data Masking, DataSunrise Database Security Suite creates a database copy with all sensitive information hidden. In the result a duplicate copy of a database is created which looks identical to the original database with the one exception that the data inside is fake. You can give access to masked databases without fear That prevents leaks and exposure of data kept in company proprietary databases. Cassandra Dynamic Data Masking is different from Static by the moment when non-privileged users and unauthorized requests retrieve fake data from databases protected by DataSunrise. With Dynamic Masking this is done on-the-fly. That means that you don’t need additional storage space for a duplicate database copy as is the case with Static Data Masking. Each of the data masking methods has its own upsides and downsides and our customers can choose which one is convenient for them. 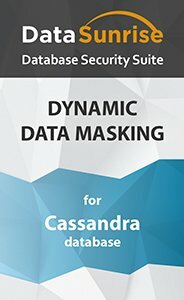 But be sure to use Cassandra Data Masking from DataSunrise if you want your databases totally protected.